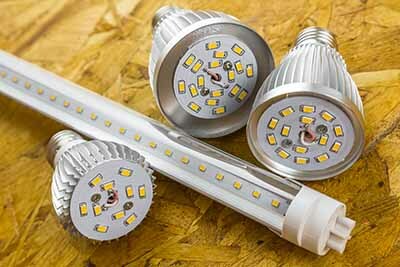 LEDs have been the top choices, be indoors or outdoors, for either hobbyist or commercial growers. But one big drawback of LEDs is their big size, making it hard to fit small spaces. That's why people invented one type of LEDs which are still powerful for most vegetative and flowering flower, while don't contain much space. Enter COB LED grow lights. But COB isn't just known for its compact size, it also has more light intensity, and advantages than traditional LEDs and other grow light types. In this post, I'll go explaining in details about the COD LED grow lights and help you pick the best ones on the market. COB, or Chip-on-Board, is the new LED technology. It has its name as the LED chips will be mounted onto the circuit board to create LED arrays. Because of the way COBs are built, COB LEDs reduce the components used and maximize the number of LED chips on the circuit. This makes COB LEDs have a number of advantages over the traditional SMD (Surface Mounted Device) LEDs, which we will discuss later. SMD (Surface Mounted Device) LEDs are the most common LED grow light you can find on the market. 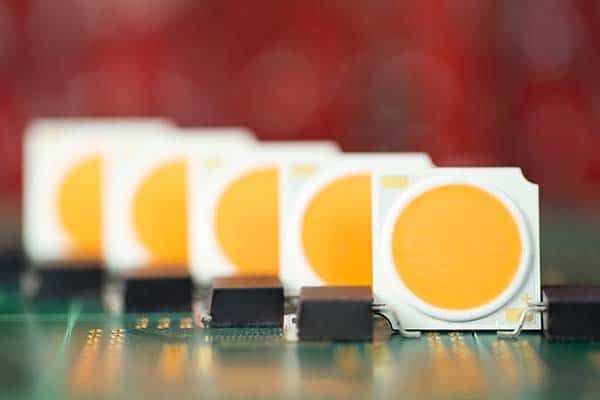 Though both SMDs and COBs share similar characteristics such as wide light spectral spectrum, long lifespan, and efficient light output, here are some of the key winning points of COBs over SMDs. Since COBs can be packed with more LED chips on the same substrate than SMD, it has a stronger light intensity and higher uniformity. Because more led chips are contained within an area and with the support of a reflector, the light produced is denser. With the use of a reflector, you can have a stronger and more vibrant light intensity for flowering plants. A 200 lumen COB LED array can be much smaller than a 200 lumen SMD because COB makes better uses of the space. 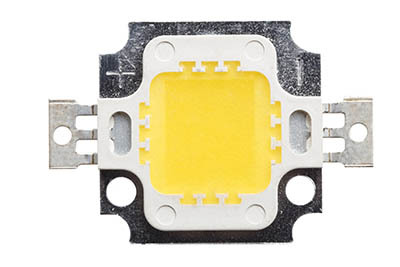 Because fewer components are used to make these LEDs, and the thermal sink is pointed toward the circuit board, COBs tend to emit less heat than traditional LEDs. But the material of the COB substrate, the heat sink structure and the board circuit design play (Source) an important role in heat distribution. That's why you should look for a quality COB LED. However, you also must know the downsides. COBs have less versatility than SMD LEDs. Even though you cannot have as many as LED chips on each array, SMDs allow accommodating more than one contact. And a single chip can have up to 3 diodes - each diode also has a separate circuit. This permit the SMD chips to have multiple colors - blue, red, green diode. Also, you can mix these colors by changing the light output of each color. Meanwhile, even though COB LEDs have many diodes, they only accommodate 2 contacts and 1 circuit. That means you often see that COB LEDs produce a single color wavelength from time to time, and you cannot adjust it like other SMD LED lights. SMDs generate more widespread light output. It gives more light distribution than COBs. In this sense, traditional SMDs have a better light coverage and penetration for the plant canopy, which makes it more convenient to grow in an opener grow area. Why Choose COB LED Grow Lights? The table below shows you that besides the cost, COB LED tends to win over other grow light types in every criterium. Let's blast through the details. This is the number one factor that affects your plant growth, especially flowering plants. Regarding this, COB LED is only behind HPS, it has a stronger light output than other light types, even the traditional LED grow lights. Heat ventilation is also a strong point of COB LED. Modern technology allows these LEDs to produce strong light output while controlling the heat emitted. Some high-end COBs also use quality substrate, drivers, fans, which control the heat to the minimum. Though COB LEDs with more power will be bigger, you'll never have such a compact light that still generate lots of light like COB, which makes it better suited for small areas. Depending on the COB material build, most COBs can last from 30,000 - 60,000 hours. This is several times higher than other grow light types. CF Grow has been one of the top-end brands in the COB LED light market. That is why it is the most expensive COB LED light among our list. Besides being well built and made in the USA, this light has a lot of great features that other COB LED lights can't compare. This includes a wide spectrum wavelength that ranges from 380nm - 780nm. A dimmable light control function is packed out of the box so that you can adjust the light intensity output from 10 - 200W. This comes very handily if you grow seedling or young plants and fear that strong light may burn the plants. CREE Led and MEANWELL drivers are also known for their great performance and stability that will last your grow system for years. CF COB LED has a built-in fan and heat system that allow the LED to cool fast, and you will not even hear the fan noise. It's not unexpected to see that it's rather expensive. Some users find it overpriced. However, if you are a seasoned or beginner growers who have some money to spend and want to have a quality COB LED for your grow space, CF Grow is the top choice. Dimension: 14.2 x 9.4 x5.5"
Roleadro is one of the most popular led grow lights sold online due to its competitive price with a fairly good quality for hydroponic beginners. The manufacturer also offers a COB LED line. With just 14.2 x 9.4 x 5.5 in size and 5.9 pounds in weight, you can have a powerful LED light with 400W. However, in reality, buyer using suggests that the light only draws about 200W. These light sound great for beginner grower, or those bounded by the space. Roleadro COB LEDs are full-spectrum ranging from 440 nm to 730 nm and come with the aluminum substrate, and fans that do a great job of cooling the LEDs. There is a 2-year warranty that is average enough on the market, which gives all buyers a sense of security getting the product. Some complaints about the fans, and the LED chips burning within the first year. Roleadro COB LED is not the top LED light on the market just like other COB LED grow light manufacturers. If you are looking for a quality one, go with the traditional LED lights. But if you look for an affordable and good COB LEDs, Roleadro COBs are excellent, especially for budget growers or indoor hydroponic grower who just gets started. UFO LED Grow Light with Cree COB is another easy-to-use light can be used for a variety of plants without burdening on your budget. This round-sized light is super compact, measuring just 10. 6 x 2.6 in, and weighing 4.4 pounds. These COBs can be greatly suited for veg plants, but seem to be underpowered for flowering plants. So be sure to pack more than one item, or combine it with other grow lights for better light intensity. Though being inexpensive, the Growstar 300W generates 108± 3% wattages, which can cover an area of 2.5' x 2.5' at 25" height. They also have a 9-color spectrum wavelength with UR and IR included - a big plus to grow any plant. The 2-year warranty policy and 30 days return guarantee are average on the market. The Hipargero LED is relatively strong with about 215W actual power consumed and emit a PAR output of 530 at 18", and 1120 at 12" within a 2x3 foot coverage as recorded by a buyer, which is enough to grow both veg and flowering plants. At that light intensity, this seems to be a good bargain. But compared with other Chinese grow light manufacturers on the market, this is a bit more expensive. These COBs have full wavelength spectrum with wavelengths from 410 nm to IR (730nm). Two cooling fans, built-in aluminium heat-sink helps product minimal heats while operating. These COBs are given a 1-year warranty, which is average. And their black exterior design does make it look stable, and stand out in your grow room - a good point for those who value product design as an important criterium. 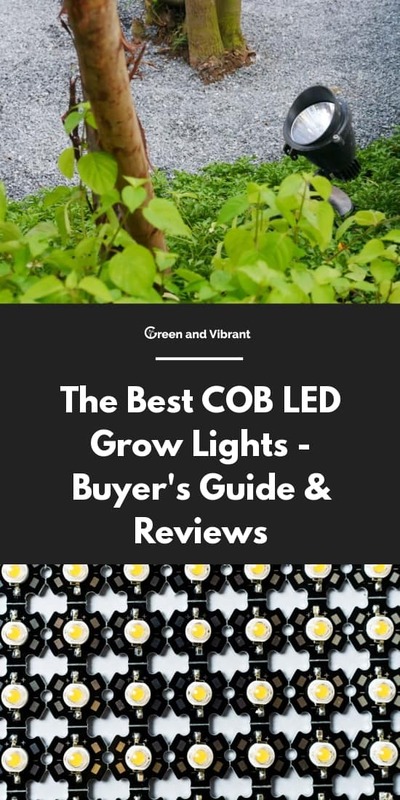 Overall, this is not the best quality COB LED light but if you're looking for a budget but strong COB that can last for some time and hope that they won't break down during the mid grow, this is a good one. CrxSunny is another good for value COB LED that is great for beginners, and budget users. The manufacturer boasts that this can replace a 1000W HPS light, but that's just a marketing gimmick. It will never have the same light intensity as a 1000W HPS light. Just like King COB LED light, it's hard to find many special features that help you choose between this and the King COB LED. These two LEDs are not so different in quality and features. So you can opt for which one that probably has a better design, or is less expensive. CrxSunny is also packed with a 3-year warranty period and 30-day satisfaction return guarantee. It's hard to find a quality LED product but at the same time inexpensive these days. That's why if you're looking for quality COB LEDs, I would recommend the CF Grow COB LEDs. They are well-built COBS with the quality CREE LEDs and a MEANWELL driver. CF Grows are also packed with all special features that other COB lights can't compare like dimmable light output, full spectrum wavelengths. This assures quality light output for your grow for a long time. However, budget growers don't have to worry as there are lots of inexpensive COBs that produce great results. We would recommend the Roleadro COB LEDs. They produce good light output, have a 2-year warranty and are well-praised reviews by online customers. These COBs could be a great introduction for small, weekend to midsize hydroponic growers.